Wellll…. It wasn’t all bad, there’s definitely a lot to learn here, and I think I can improve to get a more consistent result. There are a few changes that I’d like to test going forward. I’ll discuss my list, go over the rounds, and talk about what I’d do going forward. Let me also say I was not really prepared/set on a list. Going into the event I was definitely in the mindset of “Let’s play a lot of games and get more information on where the meta is,” so in that regard I met the goal and played quite a few matches. I would have liked to do better on day 2, but… I did get to enjoy getting my pairings delivered to my phone (push notifications from the TopDecked app I’ve built — which does a whole lot more for competitive players, too). You can also take a quick Tour of TopDecked’s exciting features! I think I played pretty well, and I have experience in the format, but I definitely was not correctly prepared for the meta (too worried about combo), and made some deck-building choices that I would change going forward. Nimble Obstructionist: I enjoyed this card. It’s versatile, plays as an effective ambush viper against Nimble Mongoose and Delver of Secrets, and can act as a mid-late game two-for-one value play. Search for Azcanta / Sylvan Library: I played these in the main deck, but for the most part I wished they were just additional cantrips. I think two ponders would play better in this spot. I’d move Sylvan Library to the sideboard, or possibly cut a Force of Will for it, if it stays in the main. I never got to play these in the control & combo matchups they were intended for, and they ended up feeling clunky/getting countered in the tempo matches where I was digging for Abrupt Decay. (sb) Runic Armasaur: This card seemed like it had potential, and to be honest, the only reason I played it was because I felt like cutting the 4th Crop Rotation from my list (sideboard slot), and replace it with something new to try. So on the drive up we brainstormed a few options. This was what I ended up with, but the entire day I wished it were an extra Pernicious Deed or Abrupt Decay – I lost to Back to Basics and unanswered one-drop creatures several times. (sb) Invasive Surgery: This was a bad meta call. I was planning around combo decks like Elves, Storm, and Sneak & Show to have a presence, and it also has some play against Miracles/Council’s Judgement, but by and large the meta was composed of fair, control, and tempo decks, and I never found it when I wanted it. I mostly wanted it to be the more versatile Spell Pierce, or something different entirely. (sb) Collective Brutality: This card was great in exactly one match, Burn, and very medium in all the others. I never really felt like I got to utilize this effectively and I’d probably cut it for something else right now. This is a holdover from the Deathrite era, and better when combo decks were more prevalent. I would probably have preferred Hymn to Tourach this weekend. Overall I’m still mixed, though. (sb) Nissa, Vital Force: This weekend I think I would have preferred to play Garruk Relentless instead of this card. I don’t think I ever got the opportunity to use Nissa effectively. I was always waiting for mana or casting her a turn too late. 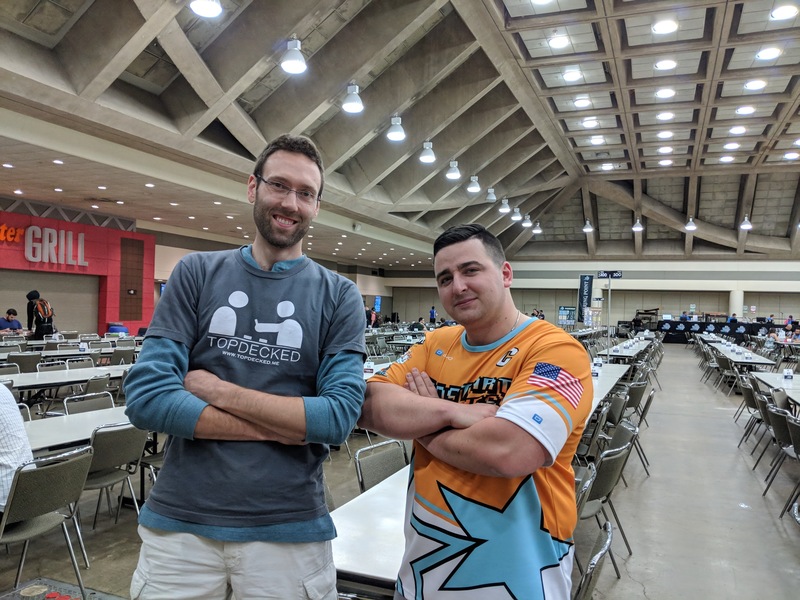 I finally got to meet Robert Benson, who’s representing Tapstart Games and writing for TopDecked! Check his articles out in the app! Things started off well, but this matchup is usually very good. Game one on the draw, I kept a hand with Sylvan Library, which is great for this situation. My opponent cast a Smallpox after I’d cast Snapcaster — I countered with Force of Will, and gladly paid eight life to draw extra cards and keep up while setting up for a Combo kill. I killed him quickly with a 20/20 to end the first game. Countering his Swords to Plowshares with a second Force of Will. Game two on the draw was much more interesting, where my opponent had two copies of Lingering Souls (6 souls on battlefield) and a Kaya, Ghost Assassin at 3 loyalty vs. my Leovold, Emissary of Trest, but I waited with a Pernicious Deed in hand. My opponent played into it, leaving just one un-flashed copy in his graveyard. Next turn I activated Deed and swung in to kill Kaya. Next turn two more souls arrived. I proceeded to play Liliana the Last Hope, and Liliana of the Veil to lock out the game. Game one on the draw, I stole with a short grind, clearing the way with Thoughtseize and Liliana for a mid-game, unanswered 20/20. Game two on the draw my opponent taps out to cast an early Monastery Mentor. I return the favor with my only removal, Liliana of the Veil, activate Liliana to kill Mentor, and my opponent has a Surgical Extraction to create a token and save Mentor. He then untapped and played Back to Basics. Obliterated. Game three on the play was a huge grind that went very strangely. I was stuck on four lands for about ten turns with a Leovold, Emmisary of Trest and Baleful Strix, holding Nissa, Vital Force and a few other spells I can’t cast with my current mana-production. I needed one land for the entire game, and ultimately died to a Gideon, Ally of Zendikar that I couldn’t remove or deal with. I kept the tokens under control as long as I could, and even up to the last turn I died, one mana would have allowed me to cast Nissa and start attacking into Gideon to clear out tokens/ get control of the game. Game one on the play I lost quickly to a barrage of creatures that overwhelmed me. My opponent did RUG Delver things and I died. Game two on the play went a LOT better. I had a turn one fetchland that I immediately activated to play around Stifle. My opponent played a Tropical Island and a Delver of Secrets, which resolved. Turn two I used Wasteland to kill his Tropical, then cast Surgical Extraction to remove all of his green sources from the game. This left him with 2x Nimble Mongoose, Wooded Foothills, Lightning Bolt, Stifle, Tarmogoyf and Winter Orb. WINNING. Unfortunately for me, the only removal I had was two copies of Baleful Strix, and my opponent had Lightning Bolt, and found Dismember to keep me from blocking. I played Sorcerous Spyglass to name Wooded Foothills, to keep my opponent from fetching away bad cards. I lost after seven turns of finding nothing to do. Game one on the draw my opponent casts a turn one Blood Moon into my hand of all non-basics, and multicolored spells with no Force of Will. I drew for turn to see if I’d find anything useful, and rather than discard to reveal what I was playing, I conceded. No matter what I take, my opponent will eventually have a Blood Moon. If I take the Chalice to unlock Crop Rotation, then I can’t fetch the Forest to cast it. If I take Simian Spirit Guide, I get a turn to Fetch, then I can hope to draw some of my three copies of Abrupt Decay, Maelstrom Pulse, Golgari Charm, or MVP Pernicious Deed… I took the Spirit Guide to try to ensure at least Black/Green mana. I don’t find ANY of them in about 6 turns. I’ve cast Spyglass after a few turns, naming Chandra, Torch of Defiance, and still wait a few turns later until I finally find Pernicious Deed… MVP! Unfortunately, I’m already at four life from being attacked by TWO Magus of the Moon at this point. Activating Deed kills my Spyglass, and my opponent plays Chandra and finishes the game with a few activations after I Forced a Fiery Confluence. Bummer, but expected. Game one things go pretty much according to plan, but my opponent gets the game locked down with Rest in Peace, Elephant Grass, and a few mana accelerants to keep the grass fueled. I had an early Leovold that prevented things from getting too crazy, but unable to attack. I ended up flashing in the Nimble Obstructionist to get some damage across but my opponent played Energy Field. Rather than use my Decay to kill Energy Field, and then die to a Helm of Obedience, I opted to wait, save my removal and swing in later. It paid off. I found Pernicious Deed, blew up everything, and proceeded to win. Game two went similarly, but I had a hand full of disruption, 2x Thoughtseize, Spell Pierce, Snapcaster Mage, etc. I basically countered and discarded all of his useful spells, then found a Jace, Leovold, and locked him out of the game. Woo! Jace ultimate finished him off. A fantastic round of Magic. Game one on the play, I had a lot of Strix, Loam, and removal. Ultimately, the game went long with my opponent landing a True-Name Nemesis, but I had time to get Creeping Tar Pit on line, and I built up enough lands to copy my Tar Pit with Thespian’s Stage and out-paced the slippery Merfolk. Game two on the draw, delver did delvery things and I died to an abundance of Stifles, Pierces, and etc. Another relatively good matchup. Unless they get a very very explosive hand with Chalice (and I have 1-drops), and a Dark Confidant, or early Liliana of the Veil I can’t remove, the games usually go very well since I can play the same Lands-style strategy. Game one on the play is a huge grind where I basically have every answer for what my opponent is trying to do at just the right time. I have the wasteland, the loam, the decays, the Lilianas, etc. I win after things go back-and-forth for a while. I had to keep his red sources offline to prevent Punishing Fire from dealing with my planeswalkers. Game ended with Jace, Leovold and both Lilianas. Game two basically went the same way, but post-board the matchup gets even better. Leovold dies early but I have a second, and win as the clock gets low with again, all three Planeswalkers. This match was brutally grindy. Game one I win after another HUGE grind. The biggest grind of the day leaving us with 18 minutes left. My opponent is super nice, and we both play insanely fast to try to get through the last two games. I’m sure I made some huge misplays… in fact I know I did. On the play, we ground it out for a bit after I landed an early Liliana the Last Hope, ticking up to kill a Snapcaster, then toward ultimate. He didn’t have an answer for it since he’d already used Council’s Judgement. I had a surgical in hand and knew I should have simply Surgicaled Judgement to prevent him from dealing with Liliana with one spell. In my head I meant to cast it on his draw step, but I should have just done it instantly while he was partly tapped down with one card in hand. No reason to give him the chance. He draws for turn and draws his second Judgement. Recked. I lose to a Gideon. I can’t blame myself too much. It was an incredibly complex match and we were both playing very very quickly. One more chance to get to day two. This is an 80/20 matchup. I don’t win this match often. Game one on the DRAW… in short, my opponent ended the game with 6 lands. I had Liliana to take a few spells from his hand, and I ended the game with three life on a turn where if he drew any non-creature spell, I would have been dead. He drew another land and I made a 20/20 to end the game. Game two on the draw again. He did his thing… very quickly, and I died on turn three. Wowzer. That’s more like it. Game three on the play was by far the most interesting. I kept a hand with Force of Will, Force of Will, Brainstorm, Crop Rotation, Thespian’s Stage, Underground Sea, and Collective Brutality. This… seems… ideal. I play my Underground Sea, and he leads with a Goblin Guide… perfect. I cast Brainstorm, find more land, draw an extra land from the Guide. Untap, Brutality Escalating twice, kill Guide, Gain 2, make my opponent discard a Lightning Bolt, see a few spells I don’t really care about, Edolon of the Great Revel. I Force his Eidolon, play my third land, and pass the turn. He’s still stuck on two lands, hits me with Chain Lightning, passes. I play stage, he bolts me, then I make Marit Lage and Crop Rotate for Dark Depths to kill him. He reveals his hand to show the Ensnaring Bridge I probably should have saved the Force of Will for. Not punished. I’m very happy to be playing free Magic. Happy to be in Day 2, continuing to ride the karma. This is a bad matchup, but there’s always a chance. Nope, just kidding. Game one on the draw, I’m at a place where I want to cast Leovold, about turn four. I cast Crop Rotation to bait Force of Will, it resolves, fetching Thespian’s Stage. Leovold resolves. My opponent casts swords — I knew I should have gotten Karakas instead. But I guess it doesn’t matter too much as he Wastelands the stage next turn anyway. Back to Basics locks me out of the game. Game two on the play I kept a risky hand with Brainstorm, Cephalid Coliseum, Loam, Sylvan Library, Decay and a few other cards I can’t cast yet. But… Loam helps solve this problem, and I’ve got a Brainstorm and two draws to try to fix that. I’ve got time…. errr… nope! I don’t draw more land, then mis-sequence my spells, ending up getting Brainstorm Spell Pierced on my turn so I can’t cast Library or Loam (revealing that I don’t have any more lands), then I get Wastelanded off green. Draw Crop Rotation next turn, then wastelanded again, and basically lose from there. I never cast Loam, and never find enough land to play anything. A quick loss.I’ll call that one my fault for keeping a risky hand, but card advantage is huge in any blue-white matchup so I really didn’t want to give up a good hand. Okay this is another matchup that used to feel easy and now feels difficult. The U/B deck has evolved and tuned to the point where it’s a problem for Baxter BUG. Game one on the play I got overrun by a bunch of Delvers, and I didn’t have enough removal to deal with them. I actually misplayed in this game because I cast loam, returning one too many lands to my hand, which took me off threshold for Cabal Pit. I lost because I couldn’t activate Cabal Pit to kill literally everything he had over a few turns. Game two on the play I kept Misty Rainforest, Tropical Island, Baleful Strix, Liliana the last Hope, Engineered Plague, Leovold, and Thoughtseize. Seems good. Turn one I Thoughtseize to find my opponent has 2x Thoughtseize, Liliana the Last Hope, three lands, and Wasteland. Well, I know how this goes, and it does: My opponent returns fire taking my Strix, I play my second land, he wastelands me (and again the next turn), and I never find enough land to cast anything again until he finds a Brainstorm to fill up on threats. Recked again. Still in good spirits though, I’m learning. Okay cool, another match I feel comfortable with. Maybe I’ll pull out a win? Nope! My opponent is super salty about how his event is going and the game is not very fun — I just keep doing my thing though. Game two one the draw I lose to an early Counterbalance that I can’t remove. I also play into literally every random flip and Brainstorm on his Counterbalance. I conceded quickly after he lands a Monastery Mentor and Jace when my Pulse and Deed get countered for free. Where are my Abrupt Decays??? Yet again I wish my sideboard had the 4th decay. Game three on the play, I kept a hand of haymakers. Sylvan Library, Liliana (both of them), Pernicious Deed, and lands to cast them. However… this opponent apparently plays three Spell Pierce, and literally everything I cast gets countered except Liliana of the Veil. He played another mentor, this time with spells to make tokens on the first turn making Liliana fairly useless, and I proceeded to lose in two turns. Oh well. Game one on the play, I have Loam, Wasteland, Decay, a few lands, Strix, Cabal Pit, etc. The hand seems great. It goes great! I sequence well, blocking one creature with Strix, decaying the other on his turn three. I untap and resolve Jace, which is basically the game at this point because I’ve found Snapcaster and other spells after Jace Brainstorm. Woo! I win. Game two on the draw I lost in a situation where my opponent had a Gurmag Angler, and I was low on life. I set up to block Angler for a turn while casting Crop Rotation, Snapcaster Crop Rotation to get the Depths combo, and if my opponent doesn’t have another creature, I’ll win. He does however have two more creatures he casts, and I died next turn. Game three on the play he gets a turn one Delver, and then floods the board with a reanimated Street Wraith (that I can block), and two Death’s Shadows. Not, beating that. I lose again. A fair matchup, I should do okay here but… again it doesn’t go well. Game one on the play I mulligan to four, (no lands in first hand, only Cabal Pit in second, and no lands in third.) Laughing as I go at this point because the day has felt pretty ridiculous, my spirits are surprisingly high and I put up a good fight, almost recovering with Liliana of the Veil, but eventually lost to the value train. Game two on the play I again mulligan to six, keeping a glorious hand with Engineered Plague, Lilly the Last Hope, a few lands, Strix, Strix. Great! I start setting up. My opponent casts turn one Delver. I cast a Strix, my opponent plays his second land, cantrips, then passes the turn. I play another Strix, find Sylvan Library. My opponent untaps, plays his third land, cantrips twice, then passes the turn again. My opponent abrades my strix and attacks for three, a few turns later finds Brainstorm to get rid of his True-Names, casts a Gurmag Angler I can’t kill, and the game is over. The mistake I made was in not playing the Sylvan Library first, to try to dig for answers for Delver/control/combo pieces. (I had depths by the end.) If I’d played the Library, my opponent likely would have cast a True-Name, I’d have killed it when the Plague resolved, and been looking at three cards a turn. Worst case he still makes the same play and I end up with more cards. I was scared to let him draw into counter-magic, but Instead I never cast the Library and lost. This was a learning moment that I hope to remember. As I mentioned before, I think I’d like to find a place to fit two ponders into the list, in place of or in addition to the Sylvan Library (I don’t think Search for Azcanta will be nearly as good in a world of Assassin’s Trophy), and in general I think a Ponder would do what I want Search to do, better and faster. It helps fix lands/colors, and it can be a better late-game draw when I need to find answers fast. Other than that, I’m not really sure what else I’d want to try before making more major changes to the deck. I still don’t think Mox Diamond is right for a build with only two loams and 24 land, but… I might play with it more. I might try more Spell Pierce in the sideboard, and Hymn instead of Collective Brutality. I don’t think Collective Brutality did much this weekend, since I only think I cast it a handful of times, and the only time it really mattered was against Burn… a match I probably don’t win anyway. Thoughts on anything I’ve said here? Things I could do better? Things you’d try? As usual, I had a great weekend with my friends, and getting the chance to play a LOT of Magic in the new post-Deathrite world was very very useful. I got to meet artist Jeff Laubenstein (Show & Tell, Recurring Nightmare). 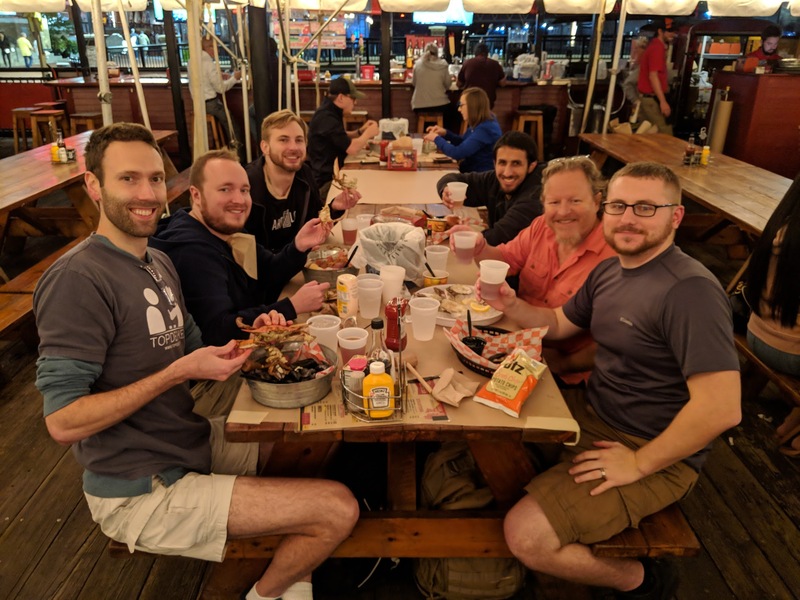 Eating crabs and seafood with Jeff Laubenstein, Kevin, Mark, Zach, and Zach after Day 1 of SCG Baltimore. … and I shut my own hand in the car window on the drive home. Just for a little reminder that Magic is a serious sport, and it’ll get’cha. I’ve just built this deck. Really enjoyable write-up, let me ask did you miss the mox diamonds at all? as I ‘ve seen them in similar builds since the banning of DRS. I definitely miss Mox Diamond. They aren’t strictly *necessary*, but they enable some very degenerate and explosive plays that just aren’t possible without acceleration like this. Sometimes people just can’t beat a Turn-1 Liliana, etc. I’m pretty surprised, after reading through a decent portion of this (the rest later when I’m not at work), that you’re running a single JTMS, not 2-3. You mention that you want to trim Library/Search for Ponders, probably. Have you thought much about one of those being a second Jace? Actually I think a second Jace might be worthwhile. I used to run 3, but that was too many. I reduced the Jace count because 3 color Miracles had a thousand Pyroblasts, but it’s probably time to try two again. I could see running two ponders and another Jace instead of 3 Ponders.